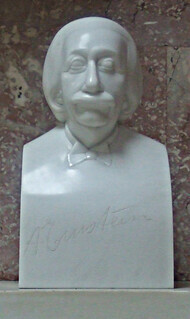 Albert Einstein (March 14, 1879 – April 18, 1955) was a German-born theoretical physicist. He is best known for his theory of relativity and specifically mass-energy equivalence, E = mc2. Einstein received the 1921 Nobel Prize in Physics "for his services to Theoretical Physics, and especially for his discovery of the law of the photoelectric effect." Einstein's many contributions to physics include his special theory of relativity, which reconciled mechanics with electromagnetism, and his general theory of relativity, which extended the principle of relativity to non-uniform motion, creating a new theory of gravitation. His other contributions include relativistic cosmology, capillary action, critical opalescence, classical problems of statistical mechanics and their application to quantum theory, an explanation of the Brownian movement of molecules, atomic transition probabilities, the quantum theory of a monatomic gas, thermal properties of light with low radiation density (which laid the foundation for the photon theory), a theory of radiation including stimulated emission, the conception of a unified field theory, and the geometrization of physics. Works by Albert Einstein include more than fifty scientific papers and also non-scientific books. Einstein is revered by the physics community, and in 1999 Time magazine named him the "Person of the Century". In popular culture the name "Einstein" has become synonymous with genius.